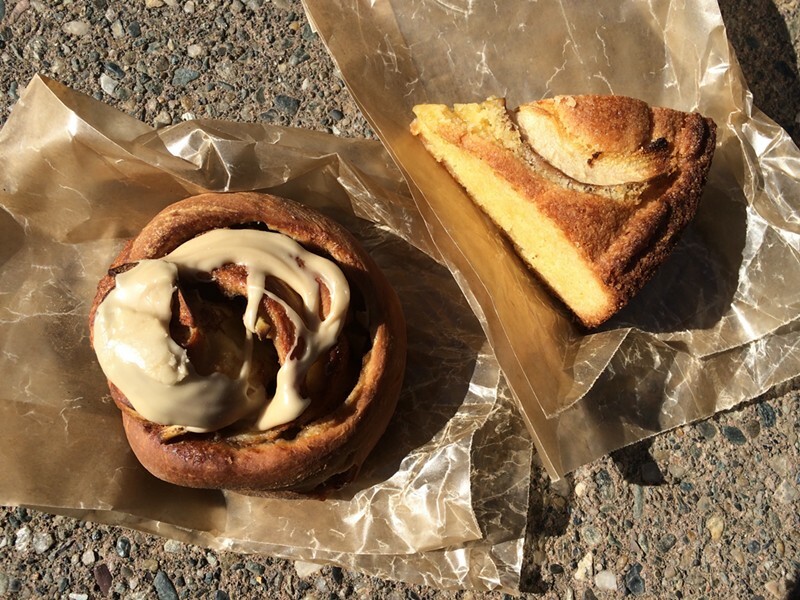 I usually say that I don't have a sweet tooth, but last Saturday, sitting on the ledge of the fountain at Burlington City Hall Park, I ate an apple-cinnamon piroshki from the Nomadic Oven stand. With the farmers market buzzing around me, I even closed my eyes, savoring the unfurling pastry curl by curl. The insides of the Russian-style sticky bun were bloated with apples. Its hard-baked edges were laced with coffee cream. When I got to the core, I ate it in one slow bite — a ceremonious process akin to uncovering an artichoke heart. I returned to the Nomadic Oven to chat with its baker-owner, Meghan Brickner. When I left her, it was with another piroshki and a slice of Amaretto-polenta cake dressed with Anjou pears. Brickner purchased the business from its previous owner, Jen Smith, in October 2015. But she told me that her initial foray into baking solo was at age 10. It was a snow day and she was home from school. The French pastry isn’t exactly typical fodder for a 10-year-old. Its invention is often traced to Antoine Carême, who codified the art of French cuisine in the early 1800s with his book La Pâtissier Royal Parisien. Croquembouche is a prodigious tower of profiteroles bound together by spun sugar and adorned with edible flowers, candied almonds and chocolate ganache. It was traditionally served as a grandiose pre-dessert offering partway through a royal banquet. In short, she wasn't interested in slice-and-bake cookies. As a bakery owner, Brickner continues to probe the realms of classic French pastry in a way that's both rustic and autobiographical. She goes for soul-satisfying staples of the French countryside rather than an enormous tower of pâte à choux. Her Gateaû Basque — “a cross between a Linzer torte and pie,” said Brickner — is butter-burnished to deep gold and flecked with slivered almonds. Its belly is filled with such things as spiced apricots or dark chocolate and raspberry. In addition, she might have on offer braids of brioche twisted with chocolate and Celtic sea salt; butternut squash muffins blanketed with streusel; cardamom kouign-amann (a Breton cake); and, sometimes, a gorgeously slouched pouding chômeur (poor man's pudding), waiting to be scooped from its dish with a spoon. But as much as the Nomadic Oven honors the scope of French desserts, Brickner doesn’t limit herself to those alone. Other cameo desserts derive from Spanish, South American and quintessentially American traditions. Think a traveler’s palate and Vermont ingredients. “I do strive to use as many local and organic ingredients as I can afford,” Brickner said. “I have partnerships with King Arthur Flour and Cabot. I use berries from Adam's Berry Farm, honey from the Farm Between, squash from Arcana Gardens and Greenhouses, eggs from Farmer Sue and cheese from Shelburne Farms. A majority of my produce is sourced from farms in Burlington's Intervale Center." With just two Saturdays left in the Burlington Farmers Market's summer season, where can one find Brickner's moveable feast next? In her words, she hopes to use the winter months to "master more difficult pastry techniques" and to host plated dessert events in collaboration with her kitchen incubator, Ri Ra Irish Pub. Brickner also takes special orders, whether a wedding cake or a platter of whoopie pies. Before next summer, the baker plans to travel abroad, including stops in London and Paris. Fans of the Nomadic Oven will be happy to know her motive: "My travels will result in some new goodies for next summer's market!" she said.